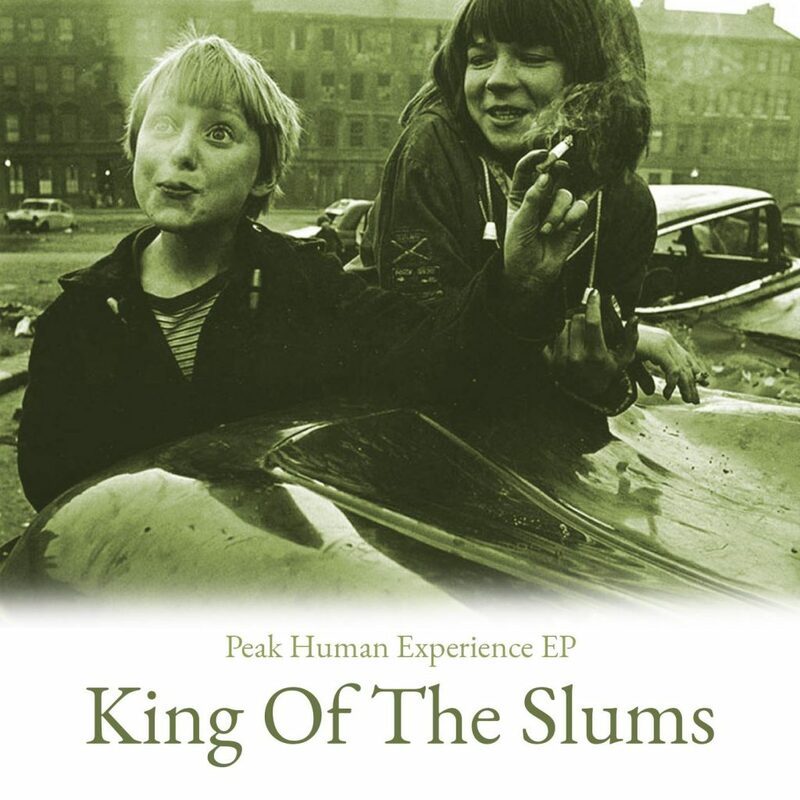 I am somewhat of a fan of King of the Slums (read my reviews of ‘Manco Diablo’ and ‘Artgod Dogs’) and their last gig at Manchester’s Night & Day Cafe is one that sits way up in my list of all time favourites. So the news that an EP was to be released led to unrestrained joy here in LSF Towers. Musically it sort of continues on from the sound of their last album – ‘Artgod Dogs’ – there’s viola/violin you’ll be glad to hear. ‘Jimmy Flamingo’ the EP opener is a swirling pulsing thing that sounds as though it’s about to launch in something huge at any moment. There’s this sense of anticipation because you know it’s going to happen, but when. And when it does, you have to wait for around two thirds of the track, it explodes into this grinding riff. Look live I can see it, when it explodes there’s going to be mayhem. Second track ‘Crombie and Grist’ continues that swirling thing with a more prominent viola/violin sound. And there’s a male/female dual vocal. The sound of this is halting, it’s warped. The female vocal is pure, the male vocal is almost spoken sung. The track spirals, it drags you in. ‘Petrol Letterbox’ is a different thing, it opens with brooding dark guitar that shifts into a slow riff. It’s slow, it’s incredibly dark. The viola throws in stabs of sound. It’s all atmosphere. What this song is about I have no idea (although I’ve had the tracks for some time now and I’ve spent ages listening on repeat, I still can’t work out what’s it’s about) but it has a sense of foreboding, of bad things are about to happen or are happening. This is very much one of the EP highlights for me. EP closer ‘Flounce’ is one of those King of the Slums’ songs that shifts, one moment it’s grinding rock, the next beautiful ballad, they do that sometimes. The first time I heard this I wasn’t sure, after repeated listening, I’m at that I love this thing to death point. Look it’s hard for me to say anything but the songs on this EP are brilliant. They are crafted, incredibly well played and thrill. The thing is that any release from KotS is something to be treated like a precious jewel, it’s obvious the band put an incredible amount of work into each individual song. You can go back, and back again, and continue going back – and you should – and there’s always going to something that you haven’t picked up before. And of course there’s always the words to listen to closely, to put a meaning together. And each release comes with the horrible sense of foreboding that there won’t be anything else after it, you just don’t know, there might be songs sitting ready for release or there might not, they might decide that it’s time to put the band on pause again.